Just as human productivity can wane at the height of summer, so, too, can that of many vegetable crops. Vegetables vary in their sensitivity to heat and humidity, and in the stage of growth at which heat can be most damaging. For some, the heat-sensitive stage is seed germination; for others, it's flower bud development, fruit set, or some other period. Understanding these stages is important to plant breeders developing heat-tolerant varieties in response to warming summer temperatures. Before seeding, growers can refer to the germination guides we provide for each crop, to determine whether the soil is cool enough for optimal germination. 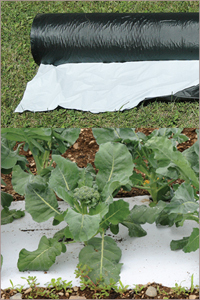 Surprisingly, many of the vegetables we think of as cool-weather crops will germinate at very warm temperatures: Brassicas in general germinate very well in a very warm greenhouse, so shade cloth is not generally needed. Cabbage and cauliflower will germinate at 100°F/37.8°C, carrots and onions at 95°F/35°C, turnips at 105°F/40.6°C. But they won't thrive if the temperature remains that high, because there are other growth stages that are more sensitive to heat. Varieties of a single crop, too, vary in heat tolerance relative to one another. In this article we recommend varieties of cool-weather crops that outperform their peers in warm-weather trials. Growers can apply this knowledge in planning the crop production cycle. The critical period for heat sensitivity in broccoli lasts just 10 days, during which time the growing point of the plant shifts from vegetative growth to flower bud initiation. This shift — not externally visible — occurs 10 days before the appearance of a tiny crown in the center of the plant, or about 3–4 weeks after plants are set out. Temperatures above 95°F (35°C) for more than 4 days during that critical period result in uneven, poorly shaped heads. A grower can use this information to choose which broccoli varieties to grow during which time slots, to maximize quality and yield. Our heat-tolerant varieties include Imperial, which is the best and Green Magic, also a superior performer. Varieties that fare well in moderate heat include Gypsy. In periods of extreme heat and/or humidity, however, such as those experienced in the Southeast, Deep South, and Florida, none perform well unless transplanted after the hottest part of summer has past. Browse our Heat-Tolerant Broccoli Varieties. For suggestions on timing your broccoli plantings for warmer conditions, refer to our Broccoli Planting Program. All Brussels sprouts, cabbage, and Chinese cabbage varieties perform reasonably well in areas with moderate summer heat. In areas of extreme heat and/or humidity, however, such as the US Southeast, Deep South, and Florida, these brassica crops will perform well only if transplanted after the hottest part of summer has passed. Beyond germination stage, cauliflower detests hot weather. In areas with moderate summer heat, white varieties that do reasonably well include Snow Crown and Amazing; for color, choose Cheddar, Graffiti, and Vitaverde In extreme heat and/or humidity (the Southeast, Deep South, and Florida), none perform well unless transplanted after the hottest part of summer has past. 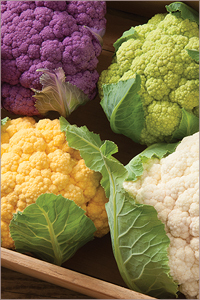 For suggestions on timing your cauliflower plantings for warmer conditions, refer to our Cauliflower Planting Program. We offer a diverse selection of greens with some measure of heat tolerance, provided the grower follows good cultural practices as well as post-harvest cooling methods and storage guidelines. Here are some more specific recommendations for success. Mustard Greens that perform well include the uniquely mild-flavored Mizuna and the popular Red Giant and Red Splendor, all of Japanese origin. Southern Giant Curled is a more traditional type. Komatsuna types with good heat tolerance include Summerfest and the smaller, darker-leaved Carlton. Shungiku, an edible species of chrysanthemum with finely serrated, deliciously aromatic leaves, is another heat-tolerant green of Asian origin. Pac Chois also prefer cool weather, but will perform relatively well in warm weather. Those that perform better in the heat than their peers include Win-Win Choi, Joi Choi, Mei Qing Choi and Black Summer. Compare days-to-maturity, color, size, and spacing with our Pac Choi Comparison Chart. Specialty Greens such as Magenta Spreen and Minutina perform well in the heat of the summer, except in regions with extreme heat. Red Leaf Vegetable Amaranth, a favorite Carribbean specialty green, is tough and resistant to both heat and some measure of drought. Heat-tolerant spinach substitutes include Tetragonia, also known as New Zealand spinach, and Red Malabar Spinach, which is heat-loving. Browse all our Heat-Tolerant Greens. Spinach should always be harvested promptly, before it begins to bolt, or stems will become stringy and flavors will be off. The benefits of irrigation previously described apply to spinach. 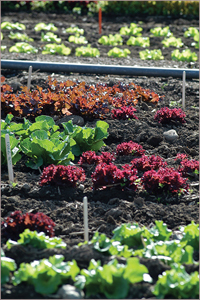 All the basic cultural practices described in Part 1, including irrigation, shade cloth, and seeding in cooler locations, should be used with lettuce as well. Whereas most lettuce varieties develop a bitter flavor when summer arrives, the Summer Crisps — also known as French Crisp or Batavia — keep their juicy sweetness. Muir, technically a Batavian type, is the most heat-tolerant. Other Summer Crisps include Concept, Nevada, Cherokee, and Magenta. 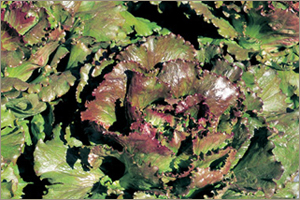 Of the other Head Lettuces, we offer a number that have earned our Heat-tolerant Symbol by performing better in heat than others: Tropicana, New Red Fire, Panisse, Salvius, Adriana, Salvius, and Skyphos. 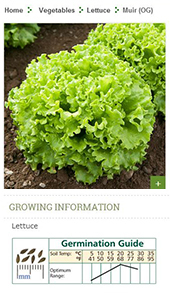 For information on which varieties to plant in sequence, refer to our Head Lettuce Planting Program. For additional info on bolt tolerance, tipburn tolerance, and heat tolerance, see our Full-Size Leaf Lettuce Comparison Chart. 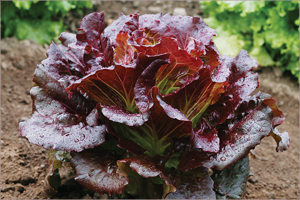 View all our Heat-Tolerant Lettuce Varieties. Carrots are grown year-round, but summer heat causes increased bitterness and decreased sweetness. Romance is our best variety for the heat of summer. When it's hot and dry, you can also grow shorter, smaller carrot types that mature relatively quickly, such as the Parisian Market variety Atlas. Growing carrots in the shadier, cooler part of the farm is critical for bringing them successfully through the heat. Sufficiently irrigating carrots from seeding to harvest can help keep soil cool, and flavor better. Roots that are well irrigated will be milder and less bitter. To learn more, see our Guide to Successful Carrot Culture. Along with holding good flavor, we evaluate radishes for heat tolerance by how crisp they stay and how soon they become pithy in warmer weather. For Round Red Radishes, we additionally evaluate how well they retain an attractive, uniformly round radish shape. Rover is by the far our best heat-tolerant radish, followed by Crunchy Royale. The other small round radishes do not do well in extreme heat. For Specialty Types and Daikons, these work well: Shunkyo Semi-Long, Nero Tondo, KN-Bravo, Alpine, Discovery and Summer Cross No. 3. 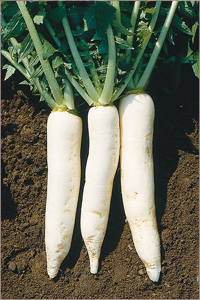 Refer to our Specialty & Daikon Radish Planting Program for additional details. Note that the flavor of all radishes will tend to be hotter and harsher in flavor when grown in hot weather than when grown in cool weather. This is especially true of the specialty and daikon types. Browse all our Heat-Tolerant Radishes. Even the most heat-tolerant, cool-weather varieties have their upper limits. In the Deep South, none of the crops mentioned in this article are grown at the height of summer — with the exception of summer carrots, perhaps. And lettuce will always perform better in cooler conditions. That said, salads are enjoyed all summer long, so a selection of varieties that perform well through the stressful summer growing conditions must always be available. The varieties we carry and recommend here at Johnny's, while still affected by intense summer conditions, will outperform others. Finally, succession planting plays a fundamental role here, including the use of Summer-Plant for Fall-Harvest Varieties. While succession planting is often regarded as a season-extension strategy in principle, in this case it relates to working in sync with seasonal temperature cycles, leveraging higher germination temperature ranges of certain crops and planning the time of harvest to occur in cooler temps. Brassicas, carrots, and turnips are prime candidates for planting in the heat of summer. To learn more, refer to the articles and calculator provided in our Succession Planting Overview. No matter where you grow, putting a plan in place before the arrival of hot, humid weather will help minimize the detrimental effects of heat on your success. 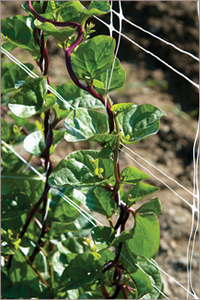 By choosing varieties known to be heat-tolerant, timing your plantings accordingly, following Best Hot-Weather Cultural Practices, and Cooling & Storing Your Summer-Harvested Crops correctly — as well as tracking what works best under which conditions — you can maximize the quality of your cool-weather crops during warm and hot weather. To learn more about hot-weather cultural practices, see Part 1. Production & Harvest Practices to Beat the Heat. Each year Johnny's conducts onsite and offsite trials to identify heat-tolerant, "cool-weather" varieties. We also consult with suppliers for data in even hotter areas, such as the Southeast. Each crop has specific heat-tolerance criteria on which it is evaluated. Flavor as well as performance and productivity are critical. Trials are timed so that they undergo the stress of the summer sun, heat, humidity, and long days. After trialing, we use the results to make our yearly selections and recommendations. Only those that pass with flying colors receive Johnny's Heat-Tolerant symbol.